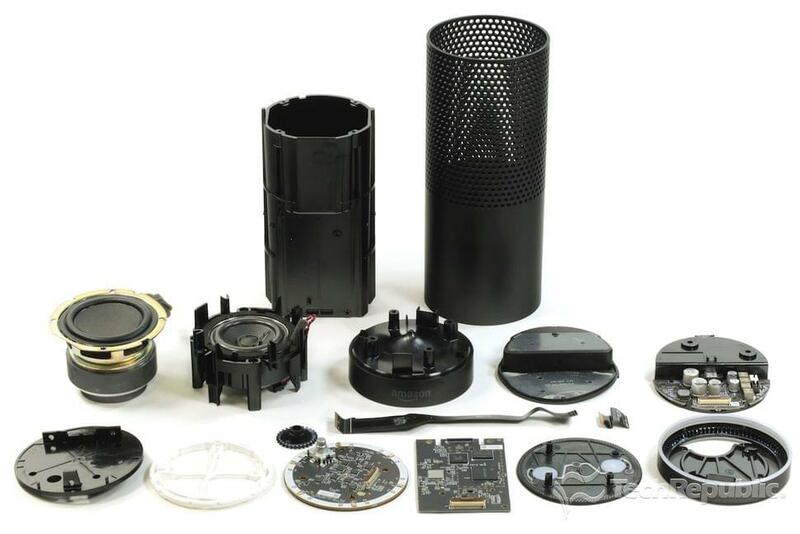 Most are familiar with Amazon’s Echo device: those tall black cylinders, or those tiny short, black cylinders. You can shout simple questions at them from across the room, and they talk back. In fact, most are probably familiar with that helpful voice that beams from these devices — the voice of Alexa, Amazon’s personal assistant. And while the idea was cool, previous Echo devices were just fancy microphone and speaker combinations. Users could only interact with Alexa vocally — a drawback that reduced the Echo to a bit of a gimmick. At the end of the day, Alexa is a lacking some major oomph, and the Echo device’s functionality is limited. They can grow stale fairly quickly, left to collect dust in the corner. 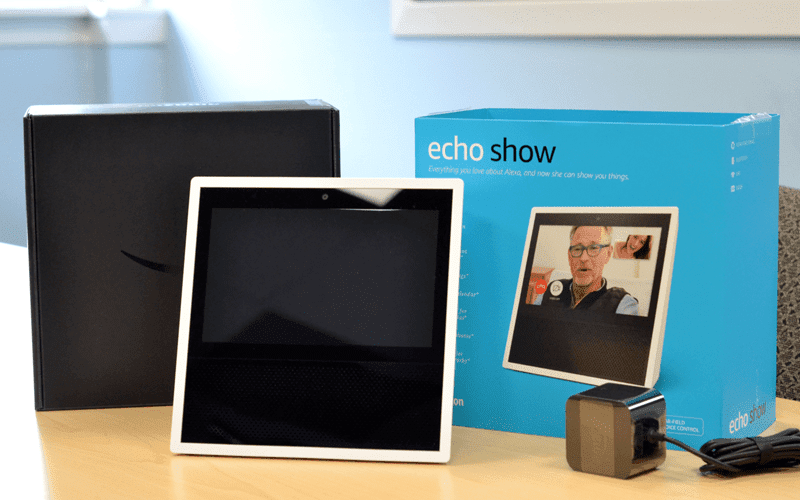 But as the next step of the Echo evolution, Amazon has introduced an entirely new device called the Amazon Echo Show. 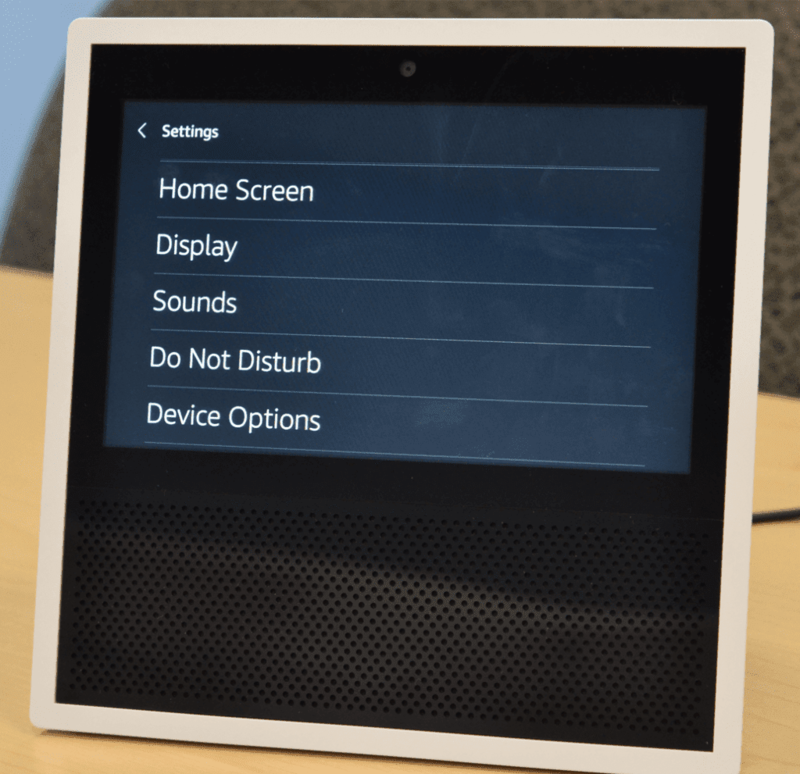 With a touch screen display, the Echo Show is supposed to bring an entirely new way of interacting with Alexa to the table — or your desk or conference room. So, we went hands-on with the new Echo Show to see if Amazon managed to create a device that will, well, actually be used to its fullest. 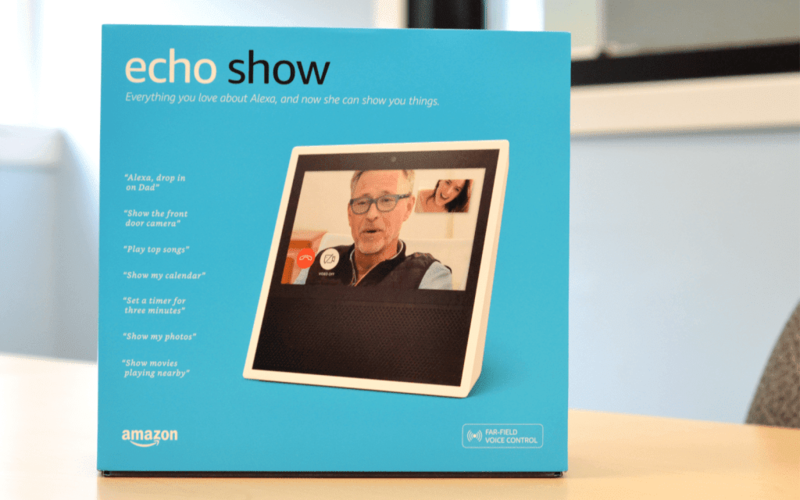 Here’s our detailed look and hands-on Amazon Echo Show review. Hands free video calling is a great collaboration feature that doesn’t waste time. Integration with calendars and the ability to manage to-do lists help position the Show as a stronger personal assistant, especially with the visual aids. A great speaker means Alexa can be heard even from the other side of your office. Overall solid build quality and feel with a fairly decent footprint means the Show isn’t just another cheap webcam on your desk. 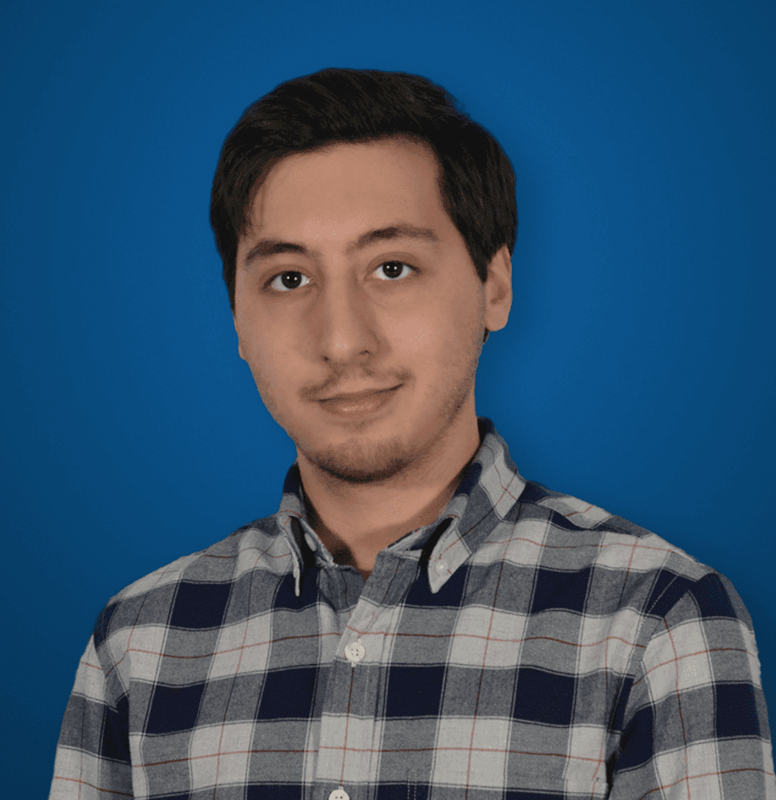 The few third party integrations that do exist currently show the promise of the Show, which could hopefully open up to integrate with some powerful apps like Slack or other UC tools. The device is tied down to a mobile phone app, forcing users to use their phone to utilize features as simple as removing tasks from a to-do list. The touch screen itself has a fairly low resolution, which might not be a complaint for many, but at 7″ screen isn’t very large either. Video calling isn’t incredibly spectacular — it just gets the job done. You can purchase the new Echo Show on Amazon here. Well, it’s an Amazon Echo with a touch screen and video camera. It can check the weather, play music, order stuff off Amazon, and check your calendar. That alone can kind of sum up the entire review. 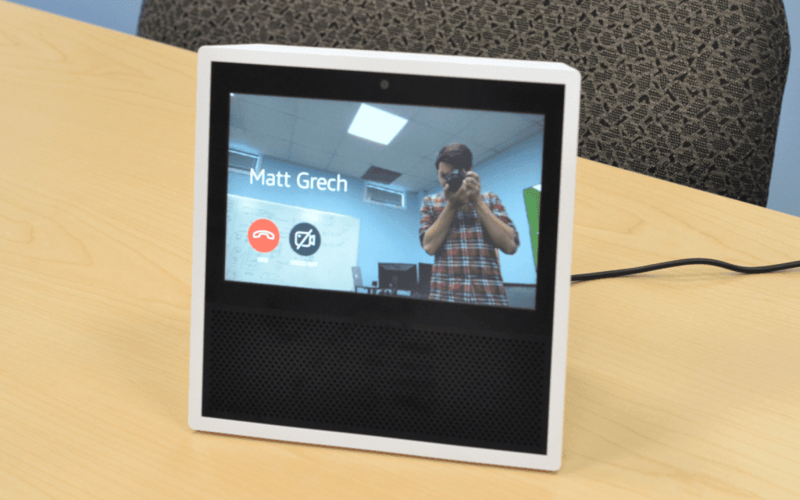 It’s an Echo with a touch screen that lets you video call, pretty simple. But, it doesn’t really tell the whole story, does it? This time around, the addition of a screen introduces some new features and functions to Amazon’s Echo lineup. Instead of Alexa just buying the most expensive product option, users can actually choose what they want to purchase on a screen, kind of like — oh, I don’t know — browsing Amazon on a computer? Oh, and you can now see the weather and forecast for the week on the display. Same goes for music, and Alexa can even display lyrics to the song that’s currently playing. Oh, right, there’s one more thing a screen allows — video conferencing. So, if the Echo and Echo Dot are meant for the family at home, what’s the Show for? Well, it’s probably family-friendly, too. However, we think the Show might lend itself to stand as a unique business tool, but we’ll get to that a bit later. First, let’s dive in and look at the new Show under a microscope. Right away, taking the Show out of the box, I was surprised mostly by the size and shape. Don’t get me wrong — from pictures alone I expected it to have a sort of retro-TV shape to it. Think those big old CRT displays, but I was expecting it to be more “in your face,” and look kind of clunky. I was surprised to be proven wrong. I had an idea of how large it might be based on the size of the box, but was a little shocked to find the Show to be more compact than I expected, standing at only 7.4 inches tall by 7.4 inches wide and 3.5 inches deep. I also knew the body was plastic, but I was expecting something a bit cheaper feeling. Generally, plastic can lead to a device with a cheap, low-quality build. But Amazon did a great job with their choice of plastic for the device.The body has a “soft-t0-the-touch” feel with a really smooth texture. While not metal, the material really elevates the Show above cheap-plastic gadgets. Overall, I was impressed with the initial build quality; it does feel like the hardware matches the price premium. The screen itself is actually separate from the body, which is more visible on our white Echo Show. While the screen does have a decently sized bezel, it’s more like what we’re used to on smart phones, with no discernible bump or drop between the screen and plastic case. The transition is seamless, with a glass panel covering the entire screen and bezels. Speaking of smart phones, the Show of course includes a touch screen that feels and acts just like any other touch device we’ve come to expect at this point. Right above the screen itself is where the Show’s front-facing 5 megapixel camera lives, which lends the Show’s strongest feature — the video calling. But since there’s also a screen, we can of course expand our media to videos as well, with access to either Amazon’s large video and movie selection or even YouTube videos. Now, that doesn’t make the Show an amazing media streaming device, but then again, who ever said that was the goal? For those curious, the 7-inch screen has a relatively small resolution of 1024 x 600. Upon first learning this, I was ultimately expecting poor performance from the Show’s screen, with a less than stellar image — but I was wrong. It wouldn’t have hurt to go with a larger resolution, but it’s also nothing that really holds the Show back. Overall, the image is crisp, clear, and perfect for the size of the screen. Frame rate is another issue, with stutters sometimes noticeable in animations, but I had no issues for the most part while watching movie trailers. Right on top of the device we have the only three buttons: one for power, and two for volume control. Surrounding the buttons in an oval is the Show’s microphone array, which houses eight separate mics. Below the screen is the real party piece, of course — the massive speaker grill. If there’s one thing to write home about on the Show, it’s without a doubt the quality of its speaker. I think the bulk and odd shape of the Show is due to housing that massive speaker. With ten levels of volume control, the Show packs a pretty powerful punch. Now, I wouldn’t expect to hear Alexa over a loud and busy office, or your home with the TV on and kids screaming. But at the same time, the speaker can easily project to fill your entire private office, if you’re lucky enough to have one. Even though it can get fairly quiet, I wouldn’t want to use something like this in an open office as it would easily distract everyone around you. Just look at how much of the original Echo device’s space is dedicated to just the speaker. Without a doubt, I was surprised rather than disappointed when unboxing the Show. It’s not as bulky as I expected; the awkward shape isn’t really an eyesore; the screen’s resolution didn’t leave me disappointed; and the device itself feels very solid and well put together. But what’s it like to use? For those who have used an Echo device, there’s not much that’s new. Of course there’s a screen, which simply adds a visual element to everything you ask Alexa to do. However, the core functionality of the Show is the exact same — just sprinkle in a few new voice commands like, “Alexa, show me the lyrics,” or “Alexa, show me my calendar.” This alone helps to expand the usability of the Show beyond standard Echo devices. One small detail that might confuse more experienced Echo users is the absence of the blue LED around the device that indicates when Alexa is listening. It’s there, but instead of a light on the device, the bottom of the screen lights up blue. Users do have the option to toggle on sounds for either the beginning or ending of your interaction with Alexa, as well. Navigation is simple, and generally done through Alexa’s voice commands to jump from feature to feature. Except now with a touch screen, users can also access the home screen by dragging their finger down from the top of the screen to display a small menu. Here you’ll find a Home button, the main settings menu, a brightness adjuster, and a Do Not Disturb function as well. Personally I think the DND option was a great addition, especially if Amazon hopes to see the Show make its way to every desk in every office. For customizing the Show, users can change their background image, how frequently the home screen updates, and what information is displayed. Overall, the settings menu is really straight forward and simple to use, with not too much or too little customization. The touch screen itself is as responsive as we’ve come to expect, and didn’t leave me frustrated when playing through the menus. But wait, there’s more! Alexa can also create to-do lists and display them for users, as well as send and receive voice messages. Users are also greeted with a home screen, one that displays the current time, weather, any current notifications or upcoming events. So even at just a quick glance, the Show can display some really useful information. Integrations are possible too, like Spotify for music and the most popular calendar solutions like those from Google and Apple. 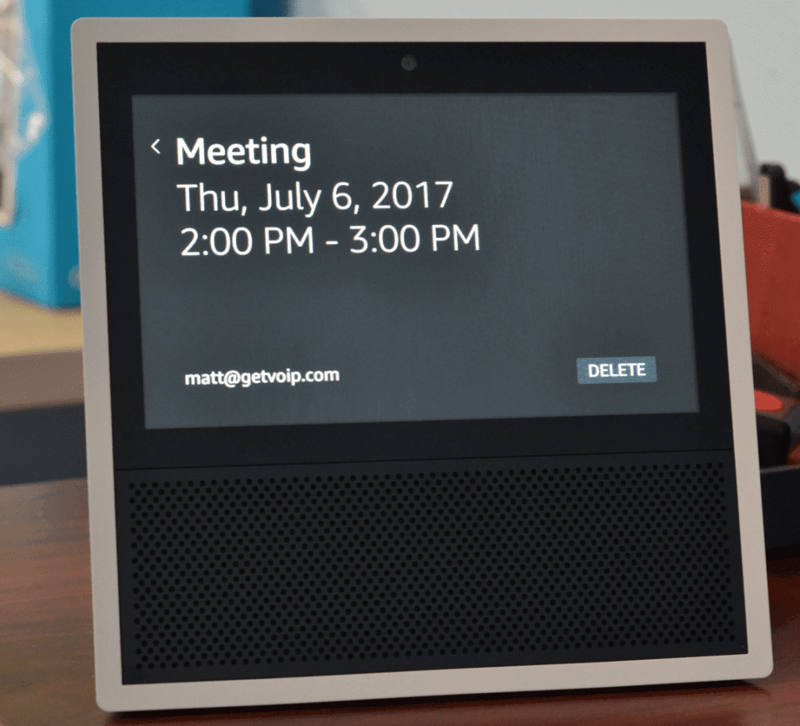 I’m personally curious to see how integrations expand the functionality of the Echo Show. 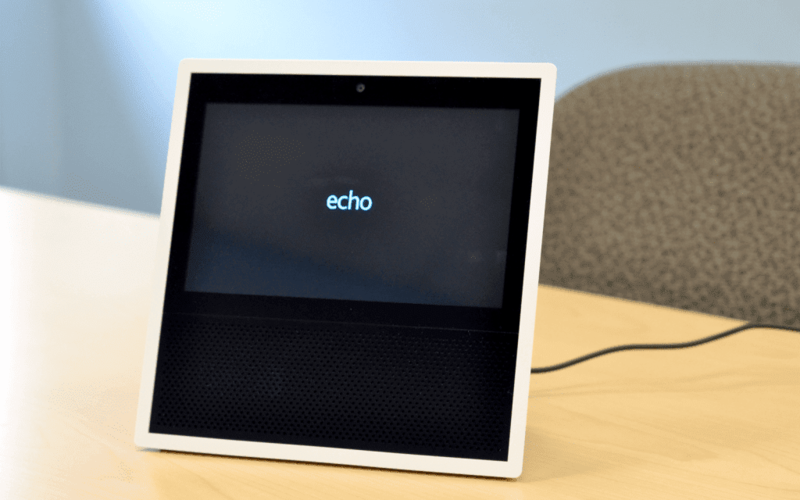 So overall, the Echo is a pleasant and easy device to use, expect for the fact that Amazon ties some functionality of the Echo down to your mobile device. For some reason, Amazon requires users to link their Show device to a new Alexa phone app they developed. Even the simple process of registering and setting up your Show requires users to download this app on their smart phone to integrate everything. From the app, users can integrate different third party services like the previously mentioned Spotify, or upload contact lists. This itself makes a bit of sense, but what doesn’t make sense to me is how certain features that don’t require a phone, somehow do. For example, Alexa can easily add new items to your to-do list just by voice commands. However, if you finish a task or want to edit a task, users are prompted by Alexa to do so on their phone apps. Why should I have to use an entirely different device just to make changes to a my to-do list? The idea is to save time, not to force me to use another app and phone. I understand why a smartphone app might be necessary for uploading contacts and integrating third party apps, but I can’t understand why it’s required for core productivity functions like updating a task list. This to me is a huge oversight, and a pretty major downfall of the device. With the foundation of the device hinged on the user also having an app and using another device, it just seems counter-intuitive. The only benefit I can recognize is that the Alexa app is free, and allows for free calling. But, it’s not the first free video conferencing solution. The real focus of the Show, with its eight-microphone array and 5 megapixel webcam, is the fact that you can make video calls right on the device itself. While its not a 4k camera for your huddle room, we didn’t have too much to complain about. Overall, in our testing, video calling worked just fine. 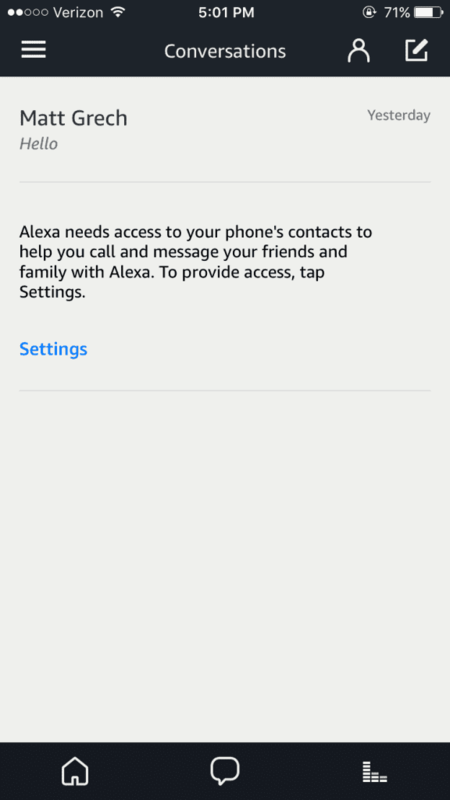 Once Alexa knows who is in your contacts, starting a call is just a simple voice command, which is actually a huge benefit — hands free calling. 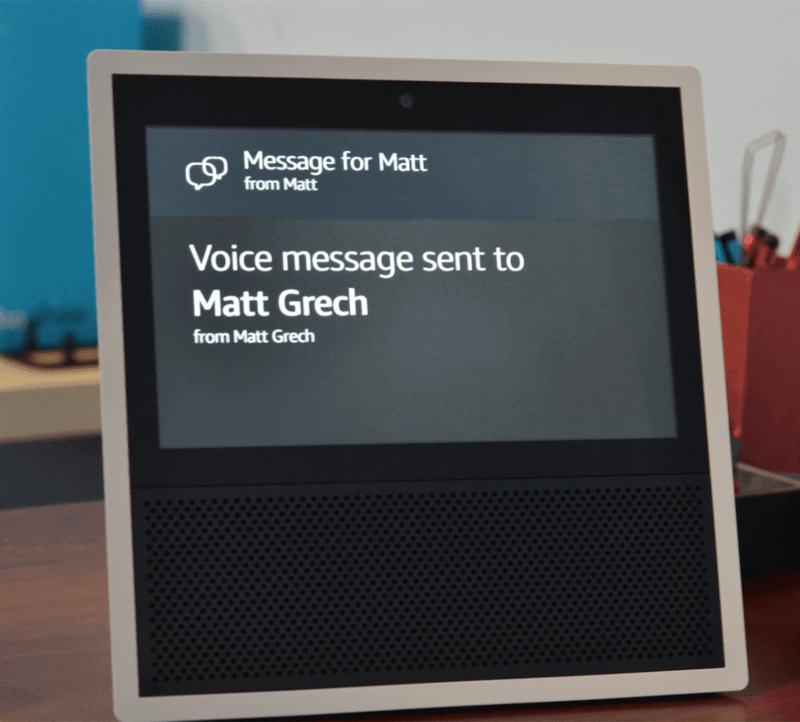 What is a bit annoying, however, is that users can only call other Echo Show devices, or users who have the Alexa app installed on their phone. This was just a silly way to shrink your user base. While I understand partnering with someone like Skype is tricky, introducing your own proprietary app isn’t the best solution as we know. Why not use the already existing Amazon Chime app, or is that too business oriented while the Show is meant for the home? I personally think its the perfect marriage. The Show’s video calling isn’t something to complain about: it works and it gets the job done if all you need is a quick video conference. But, the Show also isn’t the best when it comes to video conferencing either. Overall the picture quality is more than enough to see what’s going on and recognize who is on the other end — but, at least when using my iPhone, I noticed the screen at times could get pixelated. Audio also sounded compressed at times, making users sound like they were trapped inside a phone booth. Also worth noting is that Alexa’s functionality is incredibly limited during calls. For something extra creepy, Amazon went ahead and added in a “Drop In” function for the Show. If both users have Drop In toggled ON, this function allows one user to pretty much just appear on the other user’s device, initiating a video call that does not even need to be accepted. The recipient of the call will receive a blurred out screen for ten seconds, but then have the caller appear right on their device, and a full video call established. This might be great for dropping in on the grandmother, but can be awful in the office. 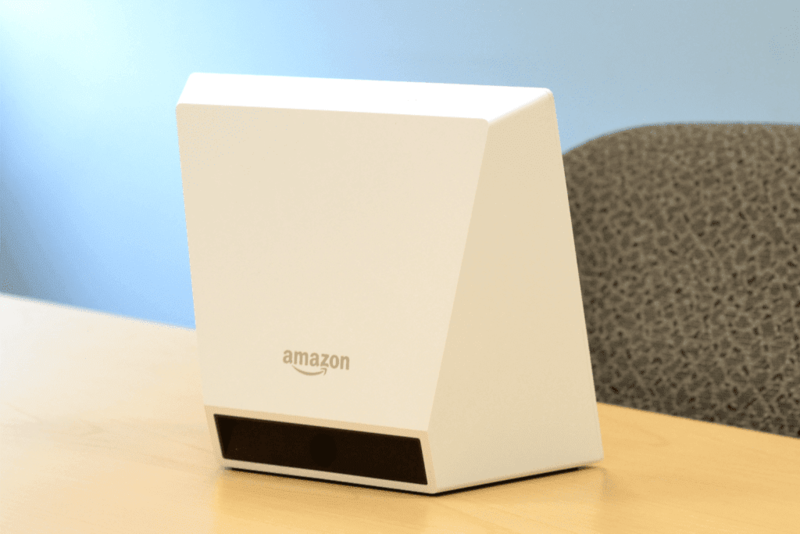 Primarily, the Echo devices have been focused on home use, and they have mainly been successful at that. When it comes to the business world, we already have a huge selection of devices from Polycom conference cams, to some really intense interactive white boards. Apple has even introduced Siri right into their MacOS, and Microsoft has brought Cortana to Windows 10, so just about anyone with an updated computer already has access to a virtual personal assistant. 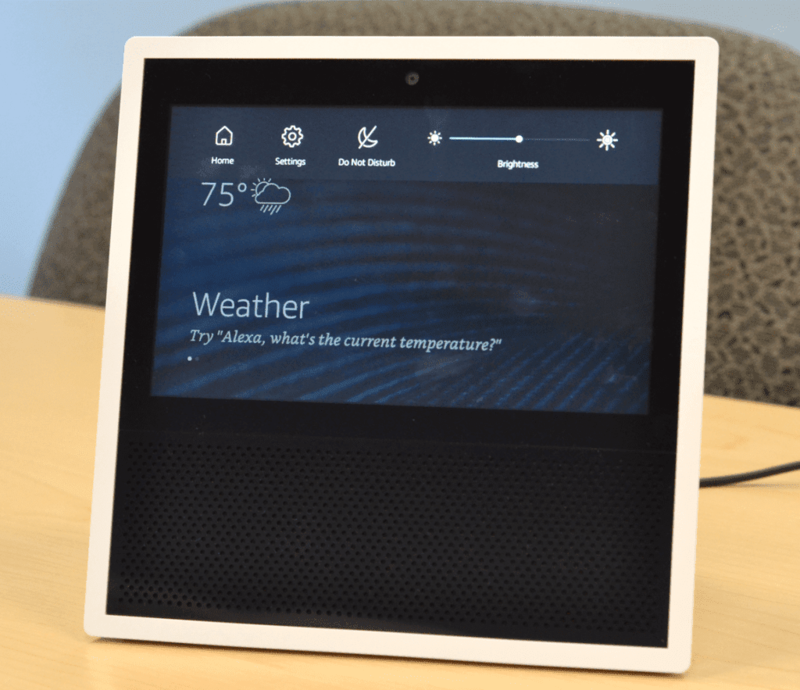 Yet, the Echo Show stands out as a bit of a unique option. I personally think it doesn’t know where it wants to be, Amazon really shows it being used at home and for families. With features like their “Drop In” video calling, it really seems to be meant for family use, because I can’t imagine anyone would want their boss to just “drop in” on a screen on their desk to see what they’re into. 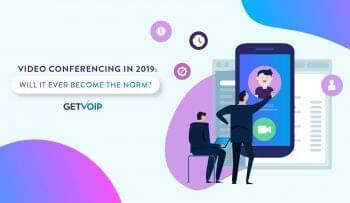 But at the same time, the Show makes a compelling case for itself when it comes to Business use — integration with calendars, to-do and task lists, video conferencing, and the ability to send message. On top of that all, what’s more interesting is how the Show can be integrated with third party solutions — and we’re talking more than just calendars. Currently the Show can integrate with some popular home security cameras, streaming the feed right onto the device. I’d be very curious to see how this expands, and hopefully we can see some integrations for popular UC solutions like Slack or its many alternatives, or even Amazon’s own Chime that I mentioned before– that alone would help position the Show as a very powerful business device. But even as it stands, Show does bring some of the right tools it needs to get the job done, for the most part. At the end of the day, what would we even use one of these assistants for? The main idea is information at a glance, and the Show helps us do that — the screen is a great way to gain information at a glance, and Alexa helps us fish for a bit more detail with hands free control. Speaking of hands free, the entire calling process is hands free, a huge benefit all on its own. Basically, the idea is that the Show will sit on your desk as another display, but as one that is dedicated to your business, schedule, to-do list, and video communications. For that, you know, it’s not necessarily a terrible idea. Even on my desk with three monitors, I would welcome a fourth little guy to take the clutter away from the others. Instead of hiding a calling app, weather, and a to-do list behind my endless windows, I can have a dedicates screen just for that information. Video calling is done hands free, like I said, so users don’t even have to interrupt their action — just tell Alexa to call someone. If that’s not efficient, then I’m not sure what is. In fact, I think the Show might be part of Amazon’s confusing UC puzzle. For a business that needs the absolute best quality, and the widest angle camera to capture a massive room, the Show might not be the number one choice. But if all you need is a neat little assistant on your desk, and the power to make personal calls, then the Show looks like a pretty good choice for a business tool, especially for the SMB owner who can’t seem to keep their head on straight during all the chaos.